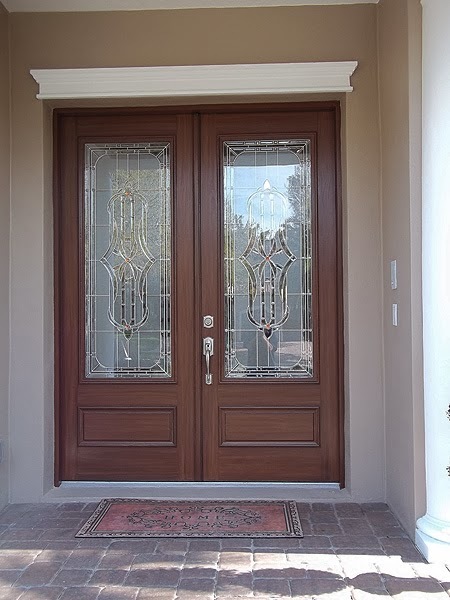 I was able to finish up on a front door project today. 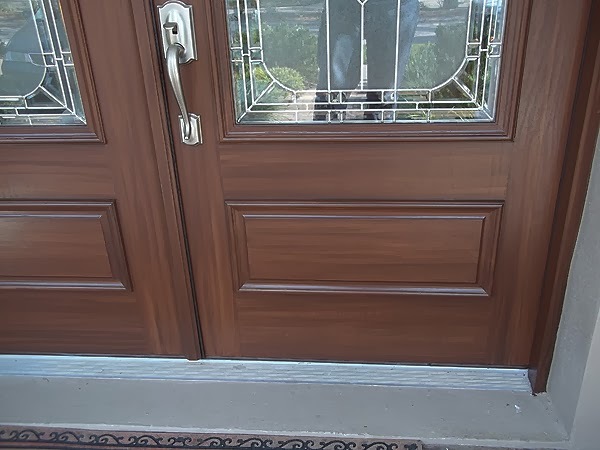 I have been creating a wood grain look on two front doors. These doors were painted with colors that I use to simulate a Walnut type of wood. 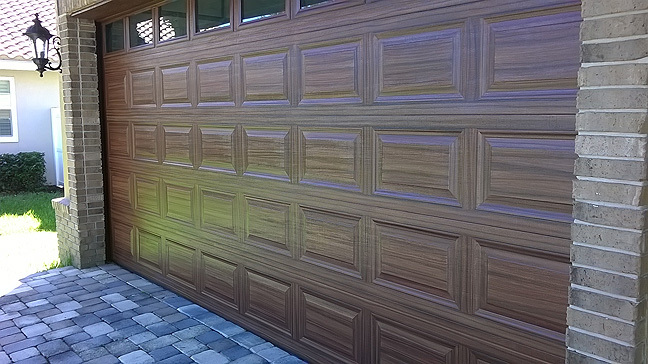 I created the wood grain look on the exterior and interior of the doors and the door trim. The doors are a fiberglass composite and they were finished off with some sort of oil based poly that had a very orangish tone to it. So the first thing I did was to clean them, then sand and prime. After the primer dried I applied a basecoat of paint. I used a SW color called Toasty. In the picture below the doors are ready to start the wood grain creation technique. 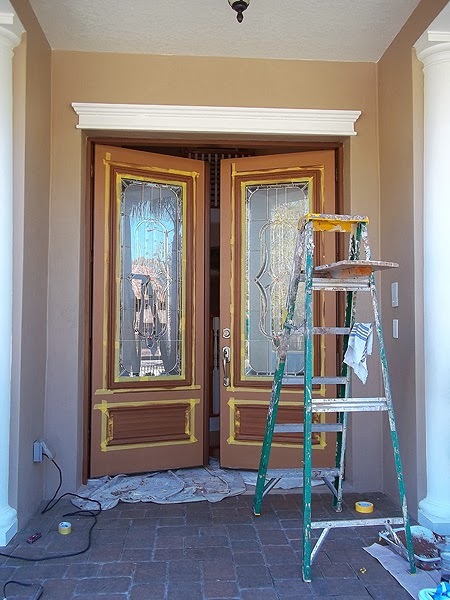 When I work on doors like these I always start from the inside out. I want to paint the trim around the windows and any panels first. These are over sized doors as far as the height goes so I needed a ladder for this job. In this next photograph you can see how I applied the first coat of brown over the base coat of paint. I use Java for a Walnut look. When that dries I use Turkish Coffee for the second and darker brown. When the wood grain work is completely done I apply a 100% acrylic UV clear coat over it. 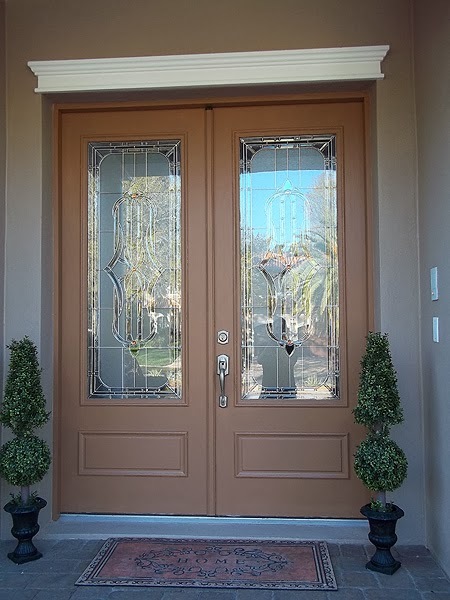 The doors came out great and the client loved them. Do you ever travel to Colorado? Would love to have you do my front doors and garage doors! I have been to Colorado and it is a stunningly beautiful state but way to far to go to work. Very nice but no place in the article does it mention how you painted the wood grain effect. It just tells that you used 2 different colors and which ones you used. Not very informative. You are correct. 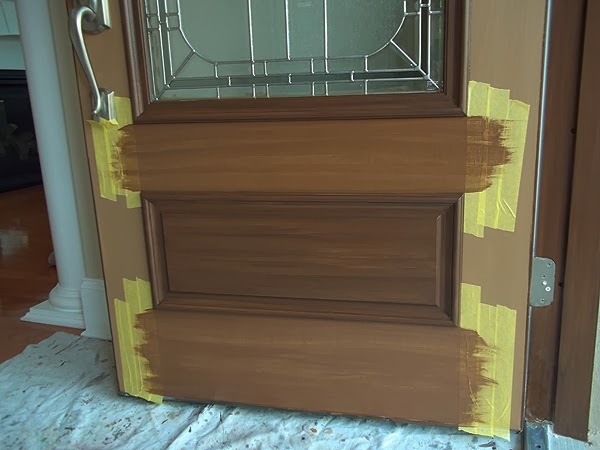 This was not a tutorial on how to paint the door, just showing it off. 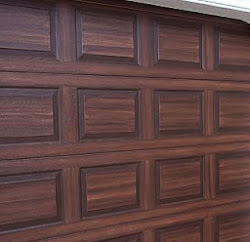 If you would like to learn how to paint a door to look like wood I sell a tutorial for only ten dollars on this site. 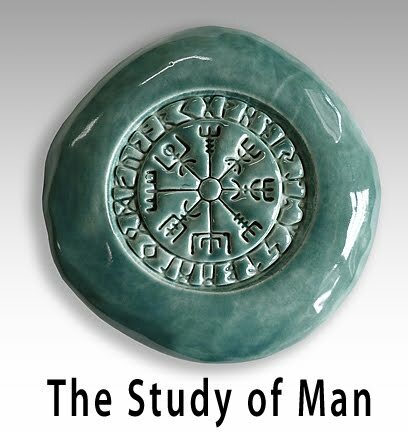 It is 132 pages long and has almost 2 hours of video clips explaining in detail the exact procedure. 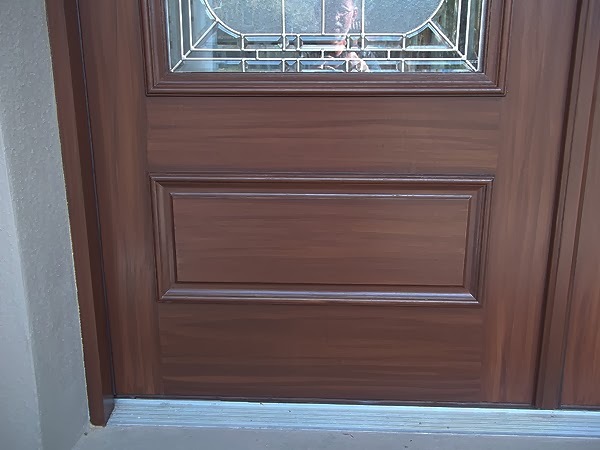 It is aimed at garage doors but the same techniques apply to entry doors. Hope this helps.